An Afghanistan war veteran misses out on Rio’s Paralympics—but it’s not stopping him from dreaming big. UPDATE: Unfortunately, Rob Jones did not make the Paralympic team this time around. However, he's still pursuing swimming and has a packed schedule. Next year, he'll take on the challenge of running 31 marathons for 31 consecutive days in 31 different cities. When Rob Jones lost his legs to an improvised explosive device (IED) in Afghanistan in 2010, he wasted no time feeling sorry for himself. Within months of being fitted with prosthetics, Jones set his sights on the Paralympics, and in 2012, the former Marine garnered the bronze medal in rowing at the Paralympics in Great Britain. A year later he bicycled across the United States. 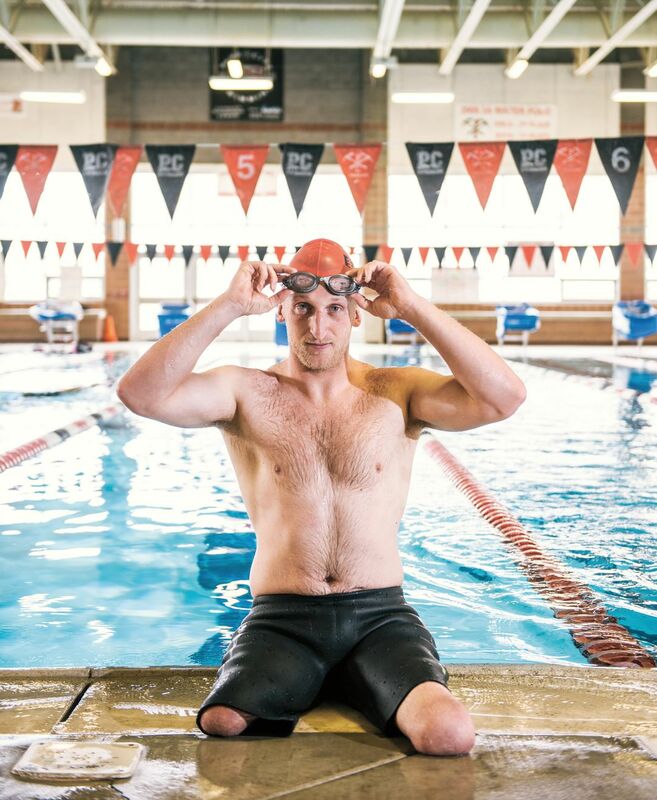 This summer, he’s training at the Park City Aquatic Center and at Mountain Velo to compete in the first-ever paratriathlon at the 2016 Paralympic Games in Rio de Janeiro in September. Jones will find out whether or not he’s earned a spot on the US Paralympic Team on June 30. I grew up on a farm in Lovettsville, Virginia. I joined the Marine Corps when I was 20 because I was at a point in life where I wanted to do something beyond myself. I was attracted to the ethos of the Marines and the esprit de corps. I wasn’t really a gung-ho guy, and sure not into personal challenges, until I joined the Corps. I was deployed to Delaram-Sangin, Afghanistan, in 2010, where we were pushing into Taliban territory. I was clearing an area of IEDs and found the one I was looking for, but I found it with my foot. I was fitted with two prosthetics at Walter Reed Hospital and worked hard to learn how to walk again. My rehabilitation included spinning, running, and rowing. I enjoyed rowing so much that I decided to train for the 2012 Paralympics and immediately began training with my rowing partner, Oksana. Our hard work paid off, and we brought home a bronze medal in our event. In October 2013 I began a bike ride across America. We started in Bar Harbor, Maine, and ended in Camp Pendleton, California. The ride was 5,180 miles long, and I finished it in April 2014 after 181 days on the bike. With my team, I raised $126,000 for three charities that benefit injured veterans: the Coalition to Salute America’s Heroes, the Injured Marine Semper Fi Fund, and Ride 2 Recovery. I was clearing an area of IEDs and found the one I was looking for, with my foot. I wish I could tell you I learned a lot on that ride, but I really didn’t. It just reaffirmed to me that I could set a challenge for myself and achieve it if I worked hard. It also reaffirmed what I already knew about the American people: they love veterans and are very generous. I also learned that this country is a lot hillier than I thought it was. I wish I’d started training for the triathlon a year sooner because I’d have a better chance of making the team. I’m pretty good on the run (his trainer Marcel Vifian confirmed that Jones can run a 5K in 18 minutes), but I need to pick up several minutes in the swim and bike. I run on blades and the sensation is like you’re on a couple of pogo sticks. There are two invitational spots for people who don’t get selected by time. I’m hoping to get one of those; that’s my best chance to get in. I met my girlfriend, Pam, at the 2012 Paralympics. She’s a rower for the Great Britain team. She comes over here on off-season, and I go over there three or four times a year. She’s coming over in September and we plan to settle somewhere in the States, we just don’t know where yet. Park City is definitely in the running. I really like the active lifestyle here. After Rio de Janeiro—whether or not I make the team—I don’t know what I’m going to do, but I’m considering stand-up comedy. I took a shot at it with some other wounded vets with Zach Galifianakis, which was made into a documentary called Comedy Warriors. It’s a different kind of challenge for me. People have to actually like you. To learn more about Rob Jones and follow his training progress, go to robjonesjourney.com. What drives me now is I just want to have as good and fulfilling a life as I can. Who knows how my life would have been different if I hadn’t hit that IED. I might have been killed a week later, it’s impossible to say. My plan was to keep deploying as many more times as possible and then maybe become a cop or go to work for the FBI or something. I have a mantra now: Survive, recover, live, climb. I mean climb both physically and metaphorically.